Many small to medium sized business are afraid of social media, are unsure what they should be doing on social media and spend an awful lot of time managing social media without any idea of what they are getting back from it. We’ve already covered how to monitor your social media activities and reviewed various tools to help you manage social media effectively. Now it’s time to take this one huge step further to automate virtually 99% of your social media accounts using technology. If you’re a business owner or aren’t that tech-savvy then some of this may be a bit over your head, so get in touch and we can look to set up the same process for you with ease and show you how to use this system. The investment in this setup using free technologies will pay for itself within a matter of weeks within your business in time saved, allowing you to spend time improving other systems and processes to become more profitable. Before people start jumping on the bandwagon about how social media should be personal, you should spend time crafting messages and treating every account differently etc. Bear with me. The reality for many businesses is that they quite simply don’t have time to be doing the work that large brands do as large brands have teams of people managing their social media activities in the background. The reality for the majority of small to medium sized businesses is that this is left to either a single marketing manager, a junior member of the marketing team or even the managing director to manage. For all of these people, social media management is not at the top of their priority list and is an area which can be made extremely efficient with technology and automation without compromising on the quality. On the other hand, if you feel that your business needs someone to be doing everything manually, then good on you, you’re probably wasting a lot of time as this is the equivalent of still using a dustpan and brush when you could just use a Dyson or a Roomba. Now, on to the good stuff. Personally we use a whole host of technologies, automation techniques and manual interactions to manage our social media channels which works for us. Every business is different, so take what you will from this and if this could work for you, then great, you’ll be saving hours or time per week through the use of smart technologies. Before we jump into the automation, let’s just look at the common ways people identify content to share on social media channels. They are likely subscribed to either a daily, weekly or monthly newsletter from a variety of industry magazines and websites or they use a well-crafted set of followers on social media to manage their news feed effectively. We use a mixture of both, with the main @ContradoDigital Twitter account following relevant digital accounts that share some awesome news about the world of digital. As always, not everything is relevant for what our audience wants, so we need to filter out this so that the content that is shared is highly relevant to our audience who is interested in technology, innovation, digital marketing, security and general digital news. Based on this, we review the content that is being published around the web and any content that is relevant we also share on our social channels, both company channels and my personal channels for Twitter, LinkedIn, Facebook and Google+. We already have technology in place to automate the majority of the social media management process which saves an enormous amount of time already but we wanted to go further and really push the boundaries of what is possible. We use Buffer to add social media updates to our queue of scheduled posts to be posted out to all social media channels along with Bitly to track the engagement from our followers to understand what content they like to read about. 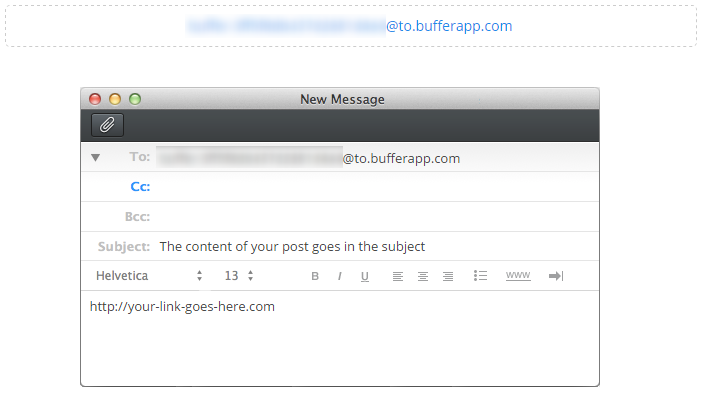 The last piece of the puzzle is how to automate adding content to Buffer with ease. Traditionally we would either favourite a news story on Twitter or open that news story in the browser then use the Buffer Google Chrome plugin or Buffer App on mobile to add this to the queue. While not particularly difficult to do, adding a new story to the queue could take up to 2 minutes by the time the pages have loaded and everything has been completed. 2 minutes, multiplied by 6 posts per channel per day, multiplied by 20 days per month equates to around 4 hrs per month spending time adding content to social media channels for our audience. I’d guess that this is already significantly less than what you spend managing social media channels, but we wanted to go one step further and significantly reduce this to only 60 seconds per day. If you haven’t come across If This Then That (IFTTT) before, then quite simply this piece of free technology is designed to automate almost anything you can imagine that you are doing manually. The service links together web based technologies through the use of Application Programming Interfaces (APIs) which can be simplified as systems talking to other systems. All modern and scalable web platforms have some kind of open API built in with them as they understand how this key functionality automates the work and grows their business. It is this what we’re plugging into to join the dots and save 4 hrs per month. There is a little more behind the scenes which we’ll talk through in a minute, but that is the gist of the setup. So let’s just jump right into how to get this set up. Once set up, you will be saving hours of time per week managing your social media activities. Most businesses spend an hr or two per day managing social media activities. We spend 60 seconds per day as we’ve implemented the right technology to become more efficient. Set up a Bitly.com account if you don’t have one already. This is going to track how many people are clicking on the links that you are sharing on social media on a daily, weekly and monthly basis. Allowing you to improve performance of your social media activities over time. Set up a Buffer.com account if you don’t have one already. This is going to automate all of your social media posts by adding everything to a pre-scheduled queue. Allowing you to simply add a post to Buffer which will then be automatically posted to your default social media profiles that you can configure to send out an update at a set time of day/week as you choose. Make sure you link your Buffer account with Bitly in the settings to track link clicking statistics through Bitly as we find this provides a bit more insight than Buffer. You also need to set your default social media profiles up. So if you have multiple social media profiles to manage, then set which are your default ones that you want to send updates to as these will be used with this automation setup. Now comes the clever part, using IFTTT. Set up an IFTTT account if you don’t already have one. 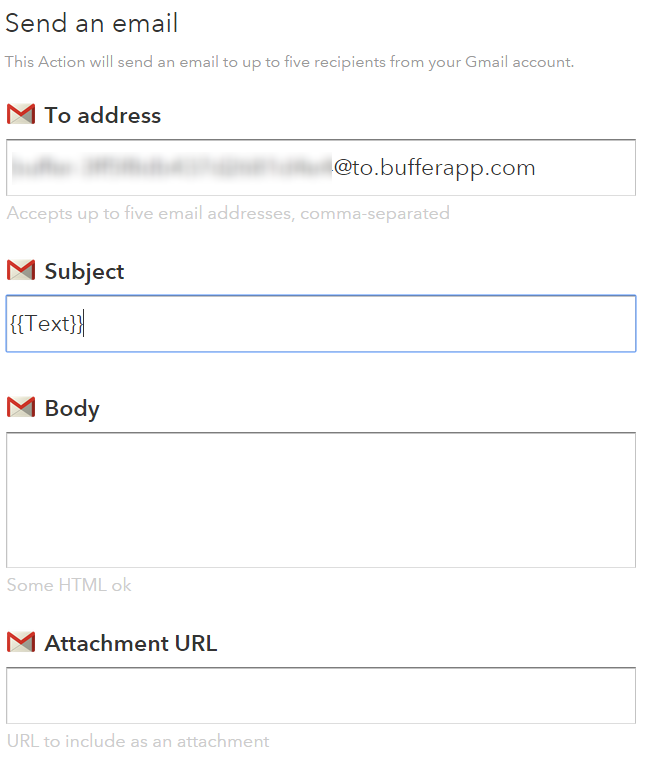 A component of IFTTT is that you create a Recipe which has Ingredients. Using this setup, you are essentially triggering an action to happen when something else happens beforehand. In this example, we want to send an email to Buffer from Gmail when we Favourite a new Tweet on the @ContradoDigital Twitter account. Once you’ve done this, it’s simple. Save the Recipe and start adding Tweets to your Favourites. IFTTT runs every 15 minutes or so, fully automated, so when it detects a new Tweet that you have starred then it will automatically post this out to Buffer. 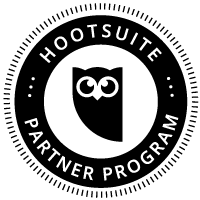 All in all, meaning that we spend an average of 60 seconds per day managing our social media accounts, saving hours per month, allowing us to focus on more productive areas working with clients to implement similar technologies within their businesses to save them time and money. If you’d like to make your social media accounts extremely efficient like we have and all of this has gone a bit over your head, then get in touch and we can look to set up the same process for you with ease. The investment in this setup using free technologies will pay for itself within a matter of weeks within your business, allowing you to spend time improving other systems and processes to become more profitable.